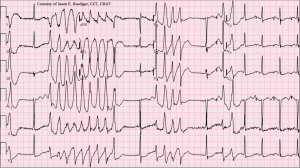 A 32 year old male with a past medical history of hypertension and depression comes to the ED with a chief complaint of intermittent palpitations noticed over the past few weeks. He denies chest pain, shortness of breath, fever, chills, or other symptoms. The patient notes that he was started on a new medication for his depression about four weeks ago and thinks it might be responsible for his symptoms. He is currently taking HCTZ, losartan, fluoxetine, and ziprasidone. His review of systems is otherwise negative and his physical exam is non-focal. CBC, BMP, and Troponin were WNL. CXR had no acute abnormalities. Initial ECG showed normal sinus rhythm with occasional PVCs and a prolonged QRS and QT interval, but no other abnormalities. As you are looking over the initial ECG, the nurse hands you the following repeat ECG and yells to come into the room because the patient became unresponsive. There are many drugs that can cause QT Prolongation (see below). In this case, the addition of Ziprasidone to Fluoxetine is the most likely culprit. What other symptoms might this patient exhibit? CNS: Sedation, Coma, Reduced seizure threshold. Cardiovascular: QRS and QT prolongation (which can lead to arrhythmias), Hypotension 2/2 alpha-1 blockade. Anticholinergic: Psychosis, Mydriasis, Dry mucus membranes, Hot and flushed skin, Ileus, Urinary retention. Extra-Pyramidal Symptoms: Akathisia, Dystonia, Tremor, Parkinsonism, Tardive Dyskinesia (irreversible). Neuroleptic Malignant Syndrome: AMS, Autonomic instability, Hyperthermia, Tachycardia, Lead-pipe rigidity, Rhabdomyolysis. Miscellaneous: Metabolic Syndrome, Galactorrhea, Elevated LFTs, and Agranulocytosis. After assessing the ABCs and beginning ACLS, consider adding Magnesium Sulfate (2-4 g IV over 10 mins) for suspected Torsades de Pointes and giving NaHCO3 (1-2 mEq/kg IV bolus) to treat the QRS prolongation. If these are unsuccessful, the recommended anti-arrhythmic is Lidocaine. Type Ia, Ic, III, and IV anti-arrhythmics are NOT recommended as they may worsen arrhythmias in these patients. Albertson TE, Dawson A, de Latorre F, et al. TOX-ACLS: toxicologic-oriented advanced life support. Ann Emerg Med. 2001 Apr;37(4 Suppl):S78-90. Haddad PM, Sharma SG. Adverse effects of atypical antipsychotics: differential risk and clinical implications. CNS Drugs. 2007;21(11):911-36. Reilly TH, Kirk MA. Atypical antipsychotics and newer antidepressants. Emerg Med Clin North Am 2007;25:477-97. Strawn JR, Keck PE, Caroff SN. Neuroleptic malignant syndrome. Am J Psychiatry. 2007 Jun;164(6):870-6.
http://www.QTDrugs.org. List of Drugs Causing QT Prolongation. Accessed on 10/1/12.